In the doodle, Sarabhai is seen with her signature parasol, standing proudly in the Darpana Academy of Performing Arts auditorium, with three of her students dancing in the background. 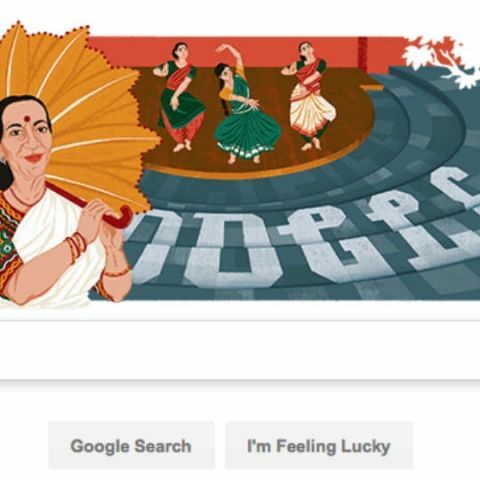 Google on Friday celebrated renowned Indian classical dancer Mrinalini Sarabhai on her 100th birth anniversary. In the doodle, Sarabhai is seen with her signature parasol, standing proudly in the Darpana Academy of Performing Arts auditorium, with three of her students dancing in the background. A Padma awardee and an exponent of the Kathakali and Bharatanatyam dance from, Sarabhai, was born on this day in 1918, Her father was Madras High Court lawyer S. Swaminathan and mother social worker A.V. Ammakutty. She spent most of her early years in Switzerland, where she was introduced to the Dalcroze Eurhythmics. It is an unique approach to music learning developed by Swiss composer and educator Emile Jaques-Dalcroze. It awakened, developed and refined innate musicality within her through rhythmic movement, ear-training and improvisation. Sarabhai started training at a fairly young age, studying both the South Indian classical dance form of Bharatanatyam and dance-drama Kathakali. She quickly developed her own technique, spirit and strength. She was the youngest of three children -- her older sister, Lakshmi Sehgal, was a part of the Indian National Army and her older brother Govind Swaminathan, a former attorney general of the state of Madras. In 1942, she married renowned physicist Vikram Sarabhai, who became the Father of the Indian Space Programme. Their children, Kartikeya and Mallika, both took to their iconic mother and pursued dance and theatre. In 1949, she established the Darpana Academy along with her husband, in Ahmedabad, Gujarat. She trained close to 18,000 students and choreographed more than 300 dance dramas during a career spanning over three decades. Mrinalini Sarabhai was awarded the Padma Shri in 1965 and Padma Bhushan in 1992. She received the Sangeet Natak Akademi Fellowship New Delhi in 1994 and was the first recipient of the state annual award of Kerala, Nishagandhi Puraskaram, which was presented to her in 2013. She passed away on January 21, 2016, at the age of 97.